Kindle vs. iBooks: Which Is The Best eReader For Your iPad or iPhone? 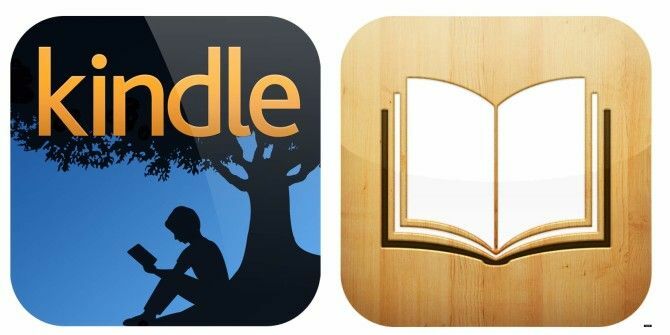 Apple’s iBooks and Amazon’s Kindle (both free) are two of the best apps for reading a book iBooks Vs. Kindle - Which Is Better? [iPad] iBooks Vs. Kindle - Which Is Better? [iPad] A while ago I wrote a post about places to find free books for the iPad. In that post, I compared the iPad to designated eReaders and expressed the opinion that it’s not a worthy... Read More on your iPhone or iPad, and each has its own strengths and weaknesses – so which is right for your reading habits? Amazon and Apple are each competitive when it comes to the price of digital books, but their respective apps each offer unique features for the purposes of annotating, reviewing, and sharing content. We’ve produce a video to highlight the main features, comparisons and significant differences between the apps. Over the years I have followed the development of each app, and that means I use them both. For general reading purposes, Amazon’s Kindle works best for me. Amazon has a wider selection of books and the online store is easier to access from on any device. On the other hand, if I were student or researcher, I might favor iBooks because it allows for copying and sharing selected text from ebooks, whereas Kindle does not. I also prefer the latest version of Amazon’s Kindle because it allows for the filtering of annotations by highlight color, notes, bookmarks and starred annotations. This filtering feature is great for reviewing the contents of a book, and you can really come to rely on it. Both Kindle and iBooks are free downloads and if you haven’t yet used them, I encourage you download them both to see which works best for your reading and studying needs. Which do you prefer – maybe you use a third choice not featured here? Let us know, below. Explore more about: Amazon Kindle, Ebooks, iBooks. Also, what are your thoughts on Audible.com and the like? I tried them, but I don't have much time to listen to audible books. Plus, I like the ability to annotate while I read. I guess if I took daily commuter trips, audible books might be okay. I'm about to buy several business/self-improvement books (authored by Alexander Osterwalder and another by Jonathan Fields). I have recently left Android/Samsung for iPhone 6 and an iPad mini (because I already have a Macbook Pro and Apple TV). I wanted to be able to view everything across all my devices. That being said, I have an Amazon and Kindle account. And of course now access to iBooks. I've had several people encourage me to buy the paperback books that I'm about to buy instead of an ebook version. I want to be able to highlight or bookmark or something. Might be nice to share things with others, though, that's not the most important. Lastly, I really don't have room left on my bookshelves. Lastly, I live in a big city and have time to read while on public transportation (bus, train, etc.). What are your thoughts on this? Hi Kim, I still like purchasing paperback books, but I resist doing so because it doesn't make sense to invest more money in a book that you might only read one time. There are some instructional books that I will buy in paperback format, but I mostly stick with Kindle books because they are easier to access, manage, annotate, and review. Like you, I have shelves of books that now have become sort of a burden. Most of them I'll never read again, so they just take up space. With my iPad and Kindle account, I can back up books quite easy and have access to them at all times. A day and one is free. Not a sample. Complete books. I have tried many new authors that way. Kindle ap for iPad is great. MarshallGulch, thanks for the feedback. As someone who is brand new to all eReaders, I found this review extremely helpful - thank you! Jason, thanks for the feedback. Since this article posted, Amazon has added additional features to the Kindle app. But all the features I cover in the video are still there. I prefer Kindle. It works seamlessly between devices without bookmarking. Donna, I too prefer Kindle, especially because of the most recent updates for filtering bookmarks and notes, and the ability to copy texts in Kindle books. I probably won't be downloading too many more iBooks until some improvements are made with the reader app. Kindle has out distanced iBooks. iBook works best for me. As a writer, author and a reader, I like books with interactive content. With iBook, I can include an introductory video for my short stories, poetry and even on my novel. I don't like Amazon Kindle because since 2008 until now 2014, they Amazon company never remitted any royalty remittance to me. I have friends who bought my eBook from Amazon but Amazon never honestly remitted anything! Ana, I’m also currently working on my first iBooks formatted book. Though it’s a lot of work, I too like the interactive features. Just wish Apple would promote iBooks more. So what’s with Amazon not paying your royalties fees? Have you tried contacting them by phone? I use Kindle for fiction mostly because their ebooks are cheaper than iBook costs. I use iBooks for non-fiction for reasons stated above. They both have their place. I mostly read Kindle ebooks on my iPhone. It is nice to use the Windows version of Kindle on my desktop. I haven't checked if there is a way to read iBooks on my Windows desktop. Is there? P.S. I haven't heard of Marvin or Kobo. What are their features? Hey Mark, that sounds like a good approach, reading non-fiction on iBooks, especially because of the copy and paste features it includes. I also occasionally read Kindle books on my iPhone when I'm waiting line, or when I don't feel like carrying my iPad with me. Thanks for your feedback. I use the Kindle. I have purchased 6 of them over the years. The HDX works great for me. Papa Jack, thanks for your feedback. I bet you get a lot better battery life your Kindle than I do on my iPad. I have both Kindle and Kobo on my tablet but lately I'm using Kobo more. The interface is great and the shopping experience is better too. Lize, thanks for your feedback. It looks like I need to give Kobo another look. I think I downloaded it a few years ago. Kindle will likely always be my choice, because I love reading on the Kindle itself, so having the iPad app provides more versatility. I do really like the iBooks interface, but I think the Kindle interface has gotten better over the past several rounds of updates, so I don't feel like I'm missing out on as much anymore. However, I do agree that the ability to copy and share things from the book in iBooks is really great. Oh Dann, I totally agree. I have been a Kindle app user ever since its first release, and each time it has gotten better with each update. I dislike both Kindle and iBooks. That is why I had always used Stanza which was superior. I can choose any font I like. I can change the page color and add my own custom wallpaper (like old paper). I can change the page brightness with one swipe. Books are nicely sorted in groups/authors/list. It also keeps your recent 10 books in a 'recent list'. Also I can connect to and download books from manybooks, feedbooks, project gutenberg etc. right from within Stanza. Then one day Amazon bought Stanza and killed it. Guess why. It still runs on my iPad 3 but who knows who many more iOS iterations it will survive? There is fortunately the mentioned app called Marvin which actually comes close to Stanza. It's so good I have paid for the iPhone version to support the developer. But of course it all depends on your needs. If you just read an ebook evey once in a while Kindle or iBooks are fine for you. Dennis, thanks for your feedback. I review Stanza a few years ago, and if I were not in Amazon user, I would probably check it out again. I like the fact that Amazon provides the free sample book offerings, which typically keeps me from buying more books than I have time to read. You can go to kindle.amazon.com and click on books or highlights to see your annotations there -- and can copy or print them. Andrys, thanks for the feedback. Yep I pointed out in the video that you can download your Kindle annotations, but I didn't specify that they can be printed or copied. Thanks for pointing that out. In my book (pardon the pun), I find it easier to have both as my library consists of books in both epub and mobi formats rather than convert the books into one format. Same for me, Ann. I don't use ibooks a lot, but it's useful to have for its feature. But based on the feedback I'm getting this article, I think I should check out Kobo as well. I just find Amazon easier to shop and manage for my needs. Thanks for your feedback. I prefer Kobo. Why aren't they included in this article? Hi Peter, thanks for your feedback. Yeah, I didn't include Kobo because I haven't used it yet. I decided focus on the e-reader apps I use the most. I believe we have also reviewed Kobo as well. I also have a Kobo, but really that is just because the device is a lot cheeper. On my tablet I would choose Kindle (or Kobo) above iBooks (or Play Books [I have an Android Tablet]) just because the system supports e-ink devices. I prefer e-ink for reading, so having a library that I can pick up from my phone or tablet if that is all I have around and I have a few minutes I want to spend reading is really just a bonus. You forgot to Marvin as an ereader app. It beats Kindle and iTunes hands down. Thanks for your feedback, Lisa. I believe I wrote a review of Marvin a while back, but I left it out this review simply because I don't use it enough. I do remember it having some really good features. I personally have never used the kindle app so I don't know how easy this is to do or possible to import files, but I love ibooks because I can easily import epub and pdf. My pick is kindle, mainly for the lower price of books. Agreed. And it seems that Amazon still has a wider book selection. I also find Amazon easier to access and browse. Thanks for your feedback, MrX. The best part of ibooks is you can have your phone 'read' the book to you. Totally agree. And doesn't cost an extra dime. Thanks for your feedback, Vince.